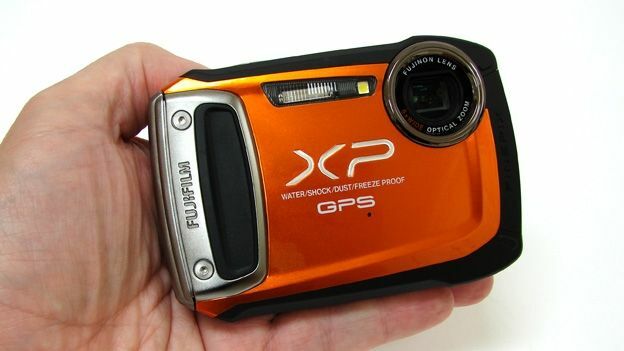 The Fuji Finepix XP150 sits amidst a range of waterproof compacts that also include the XP170, which adds Wi-Fi functionality, plus XP100 and XP50 models, which omit the XP150's GPS image tagging, this palm-sized contender for your latest 'outdoor camera' features an industrial-looking design and comes in the usual range of bold colours. With our review sample ensuring easy visibility at the bottom of any pool thanks to glossy Satsuma orange front and back plates, the Fujifilm XP150's rugged credentials include an electronic compass, promised waterproofing to a depth of 10 metres, shock-proofing against drops from two metres in height, sand-proofing, plus freeze-proofing to -10°C. Standard stuff for a camera of this ilk maybe, but style wise this is one of the cuter contenders. With competently performing all-weather rivals including the Pentax Optio WG2, which also features GPS and costs a suggested £299, plus Olympus Tough, Panasonic FT and Nikon AW camera ranges, the 'core' of Fuji's XP150 matches what you'd expect to find in any modern snapshot. We get a 14.4 effective megapixel resolution from a 1/2.3-inch CMOS sensor, Full 1080p video recording, with an underwater movie mode offered, an anti reflective LCD – here 2.7-inches in size – plus built–in sensor shift image stabilisation to avoid image blur from shaky hands in the cold and wet. Add to this ISO100-3200 sensitivity for a range of lighting conditions, 10fps continuous shooting, plus a 5x optical zoom boasting a wide angle 28-140mm range in 35mm film terms, and all the essentials are here. The manufacturer's suggested cost for the FinePix XP150 is £219, which means street prices will be less than £200, representing fair value. Other available body colours are black, silver, green and blue; but will the Fuji's performance be as eye catching as its exterior? With the exception of a narrow lozenge shaped band for activating the GPS function, the buttons on the XP150 are big and bold – just what you want if you're wearing gloves of any description, though a subtly roughened or ridged surface to the shutter release and power buttons would have improved anti-slip measures. Lucky the zoom lever set into the top plate does have a ridged upper edge and the tight concentric circle detailing of the backplate buttons prevents the thumb sliding around. Controls are obvious too: the backplate features a red record button for video, a playback button plus a familiar four-way control pad in the centre, with central menu/OK button for calling up settings and effecting changes. The camera is quick to power up in just over a second and a JPEG image is stored in 2-3 seconds. The zoom response is also swift, gliding through its range in three seconds, with the ability to gradually step forward or back in incremental stages to arrive at the setting required. A 2.7-inch screen presented in 4:3 image ratio and boasting a resolution of a standard 230K dots doesn't sound particularly exciting is this age of 3-inch or 3.2-inch widescreen LCDs or AMOLEDs with 920K dot resolutions, but as far as lining up and reviewing a shot goes it does the job, and visibility is fair. Menu screens and options do appear a little basic in terms of design and less slickly implemented than rival. While this point and shoot has a toughened exterior, it is still your basic snapshot camera beneath; and of course that's fine if all you're looking for is a camera for snaps around the pool this summer. This camera is unusual for featuring a double locking battery compartment – which means that two chunky catches have to be manually slid open before the compartment door protecting the battery from the elements flips open. Of course extreme cold and moisture can play havoc with any power supply so precautionary measures are sensible indeed. In the circumstances a quoted 300 shot maximum battery life from a full charge of its provided NP-50A is very respectable. Shooting to all varieties of SD card – including SDHC and SDXC – aside from 14.4 effective megapixel stills, there is the ability to record Full HD 1920x1080 pixels video at a smooth frame rate of 30fps if supplementing the camera's small internal memory with a removable card. Luckily the modest 5x optical zoom can be utilised when recording video as well as stills, but it's best to focus in on a subject first before beginning recording as when changing framing the camera's focus doesn't automatically follow through and re-adjust. The wide-angle lens at 28mm isn't super wide, but again it's sufficient if all you're expecting is snaps in return. In terms of stills there are occasional blown highlights and soft shots due to camera wobble if attempting to shoot one-handed, but this isn't anything we wouldn't expect from a camera in its relatively inexpensive point and shoot class. Strip away its destruction defying qualities however and you're left with an average performance in terms of imagery. Less outwardly rugged than Pentax's competing WG2, which we'd class as one of the best of its ilk around for image quality and reliability underwater, the prettier Fuji is nevertheless cheaper, more compact and less eccentrically styled. If you'd rather have wireless transfer and are not bothered about GPS, there's also the XP170, announced in May and available for around the same price. With its physically small sensor and small internally stacked lens that at no point protrudes from the camera body and into harm's way, the XP150 won't make you a better photographer or improve the quality of your shots, but it will deliver images that we might not otherwise have attempted. That in itself may well prove worth the asking price for anyone looking for a fun and easy holiday companion this (wet) summer.